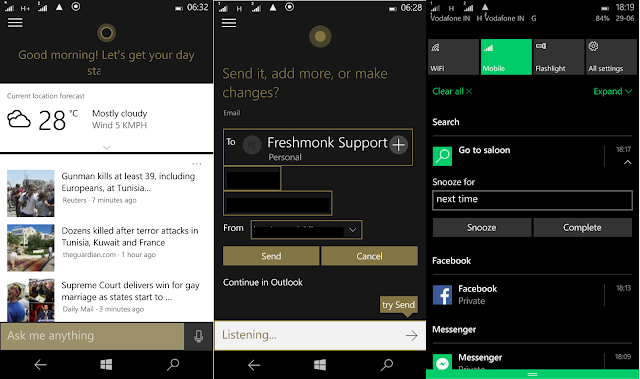 With Windows 10 mobile build 10149 microsoft added a ton of new features to the OS. Cortana is no exception for it. Microsoft says Cortana's notebook is now in final stage. Now cortana UI is also changed to display content more informatively. Cortana can now send emails. Full emails this is possible because of Cortana's integration with Outlook app. You can send email to multiple contacts at once, with subject and description. You can edit the reply if you want to before finalising send. Cortana's Notifications now also appear in action center. All these changes are awesome and they make cortana more productive. Yet not all of these features are available in all the regions and will be available soon. While all is going well some times cortana doesn't reply with voice. Sometimes Cortana doesn't take input for a certain period or only take in partial inputs. The pinned tile changes between search and cortana logo. Won't display live tile. Even in the app list it's name is Search not cortana.